Back to School: AT&T Smartphone #Giveaway CLOSED!!! It is that time of year again and I know that a hot item that all of the kids want and think they just cant live with out is a cell phone. Well, when you have teens with cells, if you are not careful, you can end up spending quite a bit of money. Well thanks to AT&T, you can get your kids those phones that they think they just cant live with out, and not have to worry about the cost. AT&T offers several options when getting a cell phone. From the amazing individual and family plans that they offer to the Go-Phones where you can pay as you go. They have Individual Plans that start at just $39.99 and Family Plans where you can have 2 phone lines starting at $59.99! With these awesome family plans you can add a line starting at just $9.99!! I dont know about you, but that is a huge plus when it comes to getting phones for your family. Another great option that AT&T offers is the GoPhone Plans. Now depending on what your cell phone needs are, the experts at AT&T can help you find the best plan for you. They can also help you pick the perfect cell phone as well!! We were sent a AT&T LG Thrive GoPhone Prepaid Package to review. Now these prepaid packages are great for starting your kids out with. I know that at this time, my daughter is not ready for her own phone. I think when her sports and practices become more lengthy as she gets older, we will need to get her a phone. But when you decide to get your kids a cell phone, going with a prepaid phone might be the best way so you can teach them about not going over the limits you want to set. Once you put a certain amount on a prepaid phone and your kids use it up, they learn to not do that the following month. Then once you feel that your kids are going to be responsible about their use on their phone, you can add them to your plan. The LG Thrive as well as other GoPhones from AT&T have the Smartphone technology that is a must have nowadays. I think the GoPhone Smartphones are not only smart for the technology, but they make parents feel smart for the decisions they make when buying them for their kids!!! The wonderful people from AT&T know that parents have a lot to get for this upcoming school year and they would like to give one of my amazing readers the same AT&T LG Thrive GoPhone Prepaid package they sent me. 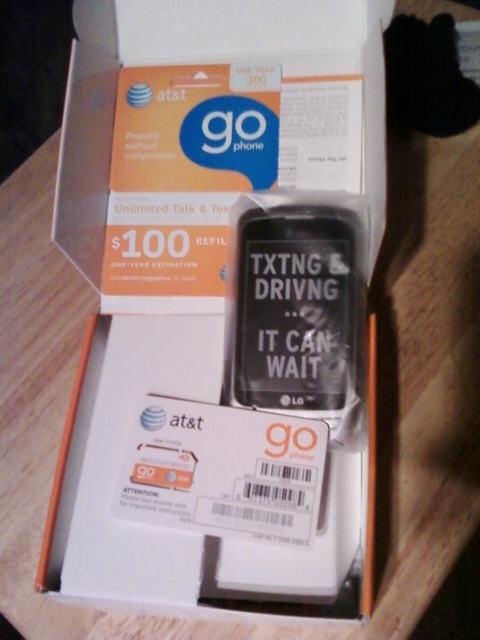 This package includes a LG Thrive, a SMS Card, and a $100 GoPhone Prepaid card!!!! Tell me what age do you think is a good age to give a kid a cell phone!! Please leave me your email with this entry! Previous Post Back to School: Carmex #Giveaway CLOSED!! I think its not only the age but the child for when to allow them to have a cell phone. But maybe about 13 or 14. I think 15-16 is a good age. I'm still torn that 14 is way too young to have a phone, and that's too big of an age for them to focus on cell phone activity rather than the real world and real friendships. I would find it hard to let my own child have a cell phone before she's even driving!! Also, I liked AT&T, as well as the new page on Facebook! We started our oldest at 14. Perfect age for us! Following you on facebookajoebloe(at)gmail(dot)comJoey J.
I think when they start high school is the right age. I don't think there's a specific age for a cell phone. I think the child's maturity level, activity level and behavior are all a factor in deciding to give a phone to your child. My daughter got a phone at 8 because that is the age she wanted to start going outside with her friends without me following her everywhere. She only had our house and cell numbers and those of her grandparents. following you on GFCAlan T.